Mode equips your team with power tools that speak your language. 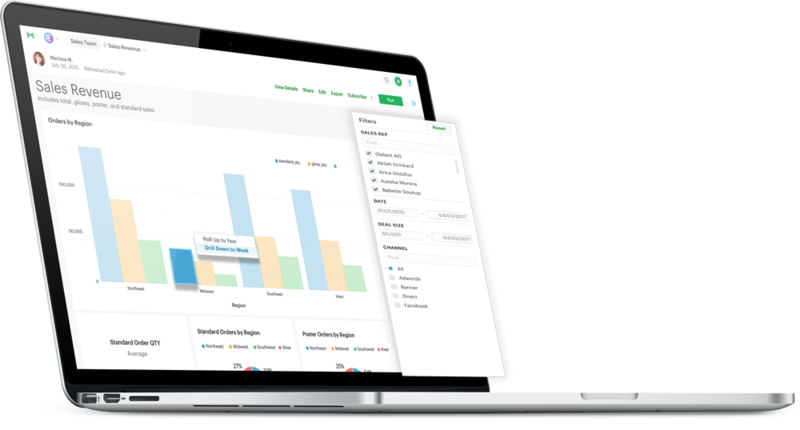 Start by exploring data using SQL and Python and quickly ship interactive reports to empower teams throughout your business. There's no tedious, proprietary data modeling language to learn and implement before finding answers. The simplicity of using SQL as the data model will bring your data experts and domain experts together to solve problems like never before. Integrated SQL, Python, reporting tools let you answer any question—and share insights with every team. There's no need to translate code from ad hoc analysis into a proprietary modeling language to empower others. 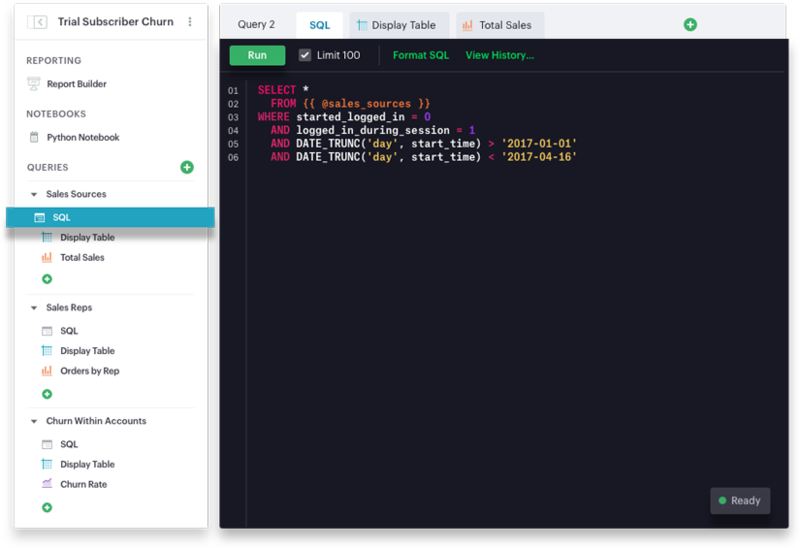 Definitions are SQL-powered logic that define data table relationships to provide analytical consistency across the platform. You'll build trust by ensuring all of your colleagues are looking at the same data. Just connect your database and start building interactive dashboards or diving into ad hoc analysis. You'll deliver engaging insights to teammates in a fraction of the time it takes to implement a BI platform. Start every new project in the powerful SQL Editor. Inspect raw data from every angle and layer on charts and pivot tables to iterate through ideas quickly. Switch over to the integrated Python notebook for advanced analysis. Curate tables, charts, Python output cells and narratives together into interactive Dashboards using the Report Builder. Then share your work instantly. After writing SQL and building charts to explore a problem, add interactive elements to your report to enable others to dig in to the analysis or answer related questions on their own. 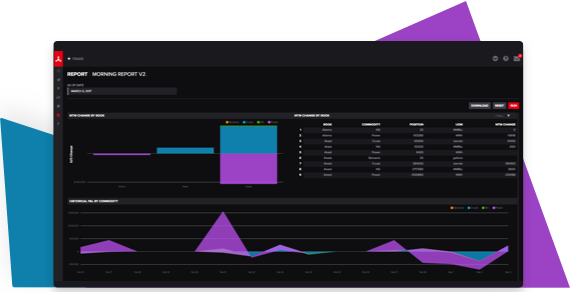 Instantly turn ad hoc analyses into power tools for daily use by leveraging features like schedules, Slack and Email sharing, filters, and custom themes. 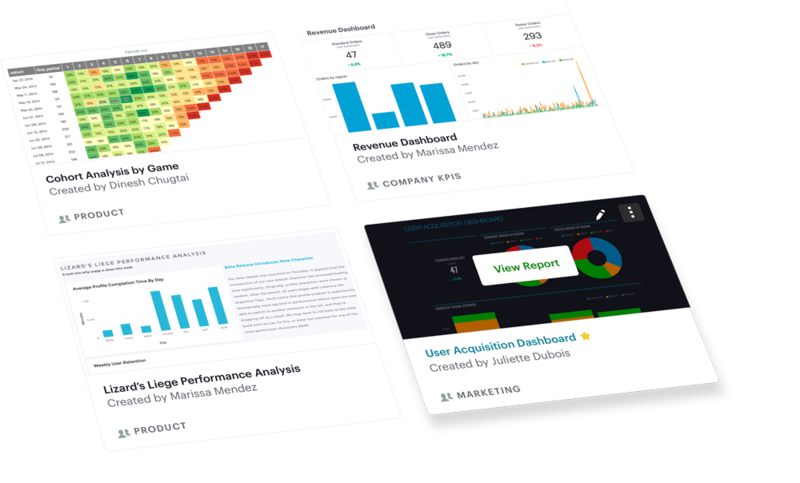 Curate ad hoc analysis and dashboards into Spaces for teams and projects. Discover existing work to use as a starting point when tackling new questions. Right data. Right people. Right time. Refresh dashboards on your schedule. Distribute reports via email or integrate Mode with Slack to help teams communicate about data and kick-start collaboration. 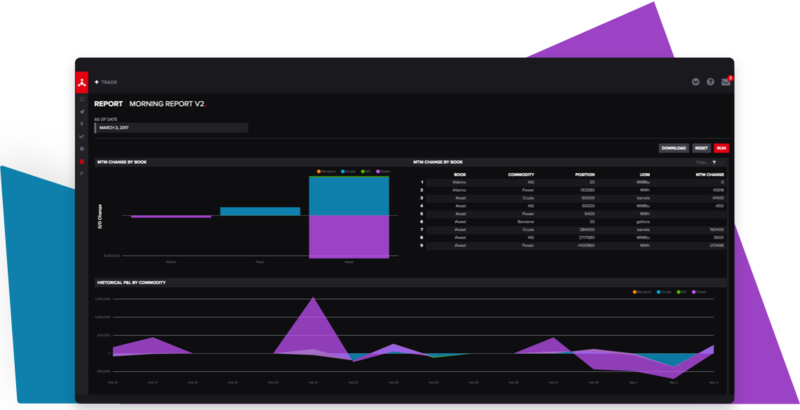 Mode's embedded analytics offering, White-Label Embeds, makes it easy to seamlessly integrate custom, interactive analytics into your application. Custom themes and filters let you completely tailor the experience to your customers' data needs. Tell about yourself & we'll reach out shortly about a demo. In the mean time, why not jump right in?